Research, plan, and test-ride your family’s new bike with us. Financing is available on any bikes we sell in store, including City Bikes, Cargo Bikes, and e-Bikes. We have a number of demo bikes in store (e-Bullitt, Xtracycle, Boost-E), and more will be arriving shortly! Apply in-store for an online credit check. It takes about ten minutes to fill out the form, and to get confirmation on your loan. Get approved in-store, for up to $10,000, and order your new bike! Bring a void cheque, or you can login to your online banking from your phone to confirm your payment details. Allows you to pay back your investment slowly, while you realize the savings of your purchase. Most electric cargo bikes cost less to finance over 60 months than your gas and car insurance alone would cost for even the most economical gas guzzler. After 60 months, you’re still not paying for car insurance, and have a fully paid off bike that (with good care) will last you another 15 years! You can repay any amount, at any time, without penalty. Get a bonus at work? Big tax refund? Sold that dusty guitar in the basement? You can pay back all, or part, of your loan in a lump sum, without penalty. Choice of monthly, bi-weekly, or weekly payments to match your own paycheque and personal needs. Paying for transportation should be easy, too. How much are you spending on your car? Or second car? Or a bus pass? This is a key number to help with your own calculations. If you don’t keep detailed records of your automobile budget, check out the Canadian Automobile Association’s car cost estimator. A small, efficient car like a Honda Civic might cost you $6,000/year, whereas a larger, less efficient SUV might cost you upwards of $11,000/year. A transit pass in London costs $81/month, or $972 / year. If you decide you’re not a four season bike rider, fear not, the LTC will get you there (just a bit slower than on your bike!) for December 1 through February 28 for $243 / winter. So far so good? Let’s look at some (fictional) examples. All the numbers below are real quotes generated by the CAA auto estimator, and FinanceIt software. Your results will vary based on factors including downpayment, choice of repayment terms, length of loan, and initial loan value. Ian wants to buy a Benno Boost-E with a cargo bag, and a Thule Yepp Nexxt Maxi child seat. He drops his four year old daughter at daycare in his neighbourhood, and then makes an eight kilometer commute to work. Last month, he sold his used Honda Civic for $2500, and took that money for a downpayment on the bike ($6700 after HST, less $2500 downpayment = $4200 loan). Ian gets paid bi-weekly, so he chose financing terms to match his pay schedule. He barely notices the $46.31 off his paycheque, and sure doesn’t miss the $120 monthly insurance bill on his old car. Over the next five years, Ian saved $20,000, lost fifteen pounds, and he still takes his daughter to school. However, she now rides her own bike through their neighbourhood on most days, and is on her way to independence. Great work, Ian! Holly has two young boys under five, and lives just a little too far from the grocery store to walk easily. She’s looking to add a second vehicle to her family’s fleet (they’re currently a one-car family), so she has her eyes on the Babboe Curve Mountain, with enough space for kids, groceries, and books from the library, too ($9200 w/rain cover, after HST). She’s planning on returning to work in two years, once both children are in school full time, so she chooses to finance the entire purchase for $217 per month, giving her reliable transportation around the neighbourhood, and family adventures throughout the city while she’s off work. She pays off the full balance owing on the bike after 2.5 years when she’s back at work, and her kids have fantastic childhood memories of spotting deer, beavers, and blue jays along the Thames Valley Parkway! Compared to buying, insuring, and maintaining a used car, Holly saved $12,000 in vehicle costs over three years, even after taking a few taxis on the coldest and rainiest days of the year! Bravo Holly! Kate and Mohammed have two responsible teenage daughters, who are independent and involved in lots of activities around the city. Their older daughter plays competitive soccer four days/week, and has a part time job at Masonville Mall. Their younger daughter is serious about her saxophone, and takes twice weekly lessons at Junction Beats, while spending her summers umpiring softball at baseball diamonds around the city to make some spending money. Always feeling stretched for time, and spending their own leisure time driving their kids everywhere, Kate and Mo make a deal with their daughters, and invest in two Fuji Conductor e-bikes for the family to share. The smart parents pay half of the cost of the bikes up front, while the girls are responsible for the ongoing monthly payments ($5900 after HST, loan value $2950). Each daughter pays $50/month over 3 years, and has a bike to take away to university when it’s time to leave home. The freedom to get where they want to go means the girls can be independent, and parents get more quality time for themselves. In the meantime, Kate and Mohammed borrow the bikes for their date nights, and have fun riding effortlessly to dinner downtown at their favourite restaurants on warm summer nights. That sounds like great parenting to us. 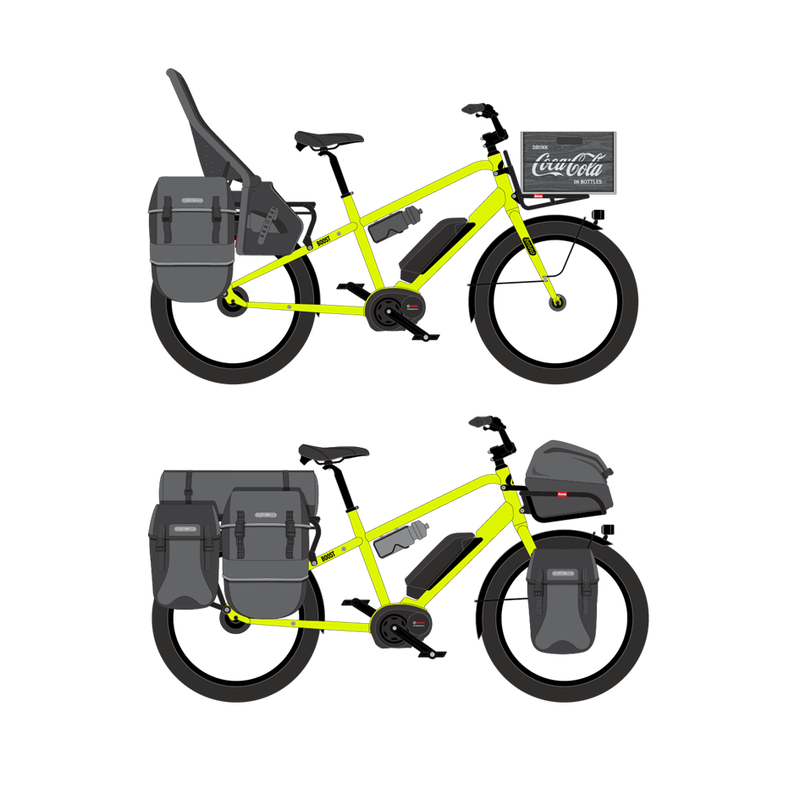 We know that buying a cargo bike, particularly an electric cargo bike, is a huge up-front investment for a family, but we also know that these bikes represent a huge long-term cost savings, too. By offering financing, we can help you bridge the gap between cost and savings, and take the leap toward a healthier, happier future for your family. Book an appointment today today to talk about cargo bike options, and get your family moving this summer!